It is no secret that I was very impressed when I was invited to attend a concert by the Crosby Symphony Orchestra back in November. On that occasion they played Nieslsen 4th Symphony. I was delighted to be back again for their St George's Day concert which was held at St Faith's Anglican Church in Crosby. The first impression when entering the vast Victorian church is that it smells of incense. The church is described as being in the liberal catholic tradition. The Concert was called 'This Island Nation' and featured the music by Benjamin Britten, Edward Elgar and Vaughan Williams- so more England than Britain. As on my last visit I was very impressed by the orchestra and the guests they attracted to perform with them. Susan Marrs sang the Elgar Sea Pictures to the delight of the large audience. The second guest was the conductor Adam Kornas, a young man whose conducting debut at Wigmore Hall included a work by Harrison Birtwhitle with the composer in attendance. He is also a composer with a ballet suite already performed along with a String Quintet 'Paradise Regained' which has won prizes and been played in London, Salzburg and Vienna. The piece is based on John Milton's epic poem and the composer explains: "...the music starts very dark and lost, moves through passion and despair, but then ends in peace. This journey from darkness to light loosely reflects the journey between Milton’s, Paradise Lost and Paradise Regained". Throughout the concert Adam explained a fair deal and he clearly has a very good and relaxed style when it comes to addressing audiences. The main work was R Vaughan Williams (RVW) London Symphony dedicated to the memory of his friend George Butterworth who died in WW1. RVW was the link between most of the WW1 composers. Although he was of an age when he could have been excused military service he volunteered to serve in the Medical Corps. Two of his most important compositions are linked with WW1; The Pastoral Symphony and Dona Nobis Pacem which is more overtly a memorial. Chatting to members of the orchestra in the interval they were really pleased to have Kornas working with them and they were overflowing with enthusiasm for him. At the podium he is very expansive and the audience took to him. File his name away I suspect we will hear a great deal more of him. The concert was a great success-apart from the minor irritation of the women in front of me who insisted on videoing and photographing the proceeding despite entreaties in the program not to do so. 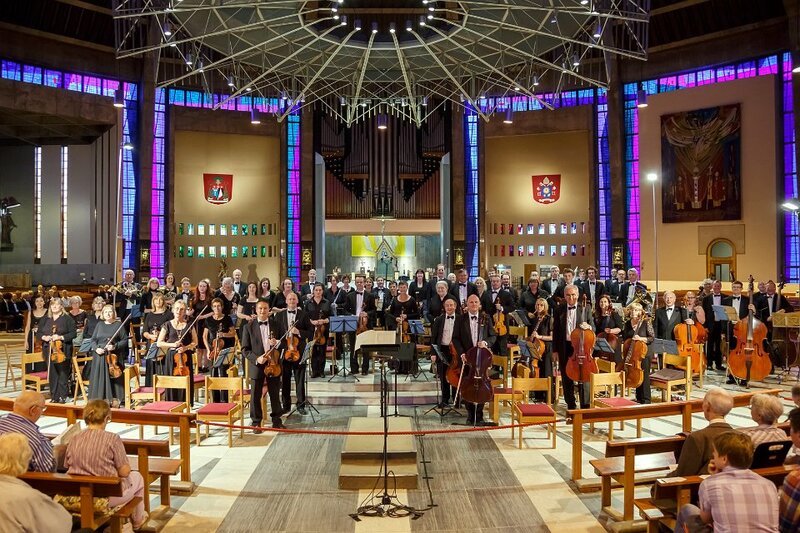 The Crosby Symphony Orchestra's next performance-entitled Heroes and Demons- is at the Philharmonic Hall in Liverpool in July when they have Shostakovich's 4th Symphony on the programme. A special word of thanks to my host, the Orchestra's Vice President, Brian Worster-Davis.